Where do I start? My first introduction to sport was as a small child watching my mother play tennis. She was very competitive. I saw it in her reactions to a shot that put the ball into the net or when the ball landed outside the lines that defined the playing area. My mother also played field hockey and my father played rugby league. All my siblings played sport, as did many of my uncles, aunties and cousins on both sides of my family. My grandfather played lawn bowls and, as my family shared the house of my mother’s parents, I would experience him coming home most Sundays always affected by alcohol, and sometimes with a gift for his performance on the greens or a tray of meat from the raffle. At school we had swimming and athletic carnivals. I didn’t learn to swim until a little later, but I loved the athletics. It was a little different back then: as well as the running we had the three-legged race, where two people standing side by side would have their ankles tied together, meaning that they had one leg each free and the other two legs had to work in harmony with each other. We also had the sack race. We climbed into a potato sack and then had to jump our way to the finish line. Such fun! Even then I was very competitive and good at all the events in comparison to others. I was surrounded by sport. At the age of seven I started playing rugby league. I had two years in the Under 8’s, winning the competition the second year with me scoring all the tries. The attention that I received from all these experiences when young reinforced my competitiveness and showed me that sport was the way to satisfy my need for recognition, allowing me to feel a little more comfortable with myself, albeit only temporarily. The seeds that were planted watching my mother play tennis were now starting to shoot. At 11 or 12 I started playing cricket. I tried tennis but was not as good as I was at the other sports so “I did not like tennis.” The cricket and football continued at school and for the relevant clubs, and of course every year there was a school athletics carnival. Swimming was another sport that “I did not like.” Success in the sporting area as a child and during my early teenage years gave me what I was looking for, being able to feel better about myself and have people like me. But that need was never fully satisfied. It was at the age of 11 that I started to learn that I could punish my body, which allowed me to be ‘better’ at sport. I needed to lose some weight to make the 5 stone 7 pounds (or 35kg) school representative football side, so every day I would run 3 miles or 4.8 km. I lost the weight. I liked doing that. My introduction to fitness was another distraction to continue my journey away from whom I truly was, progressively changing me from that tender, gentle and loving boy who came into this world six decades ago. At school I was never top of the class as a student, the exception being in PE at high school. Otherwise, in classes of 30 plus students, I always finished in the middle, which started to feed a line of thought that I was ‘Mr Just Above Average.’ I knew that I was good at sport compared to my schoolmates, but not really good. Later on, this would feed into every part of my life. Through my early teens nothing really changed. More success on the sporting field, my parents willingly paying for numerous trips all over the state of NSW. I was turning into a spoiled brat. I was always demanding more from my parents: I had perfectly good shoes but desperately needing the much more fashionable Nike or Adidas. I remember having a big dummy spit because they would not buy me those shoes. I always needed the best football or cricket equipment. I showed no appreciation for what I received; in fact, I expected nothing less. My parents got what they wanted but I was making them pay for it. I started playing first grade cricket at the age of 16 and mixing with older men was a whole new experience. I had to become tougher than I already was, both physically and mentally. I was fortunate enough, again, to be successful and allowed myself to continue feeling good about myself. Three years later I was playing first grade rugby league in a high-quality competition. Physically and mentally this demanded more of me. I had to train harder and there was more competition for a spot in the top team. This did not go well with my nervousness and anxiety. On game day I was not a nice person to be around. I would spend most of the morning in a room listening to AC/DC and other rock bands of the time. The purpose? To rev me up, make me feel more aggressive which I needed to be. Aggression was not natural to me so I had to call that energy in to survive in the coliseum, something I needed to do to feel better about myself and have people like me. The truth is they liked me for what I did more than who I was. Travelling to the game I would be feeling nauseous from the nerves and in the minutes just prior to the game, dry retching or vomiting. This was all a part of my preparation. In fact, if I did not start dry retching I would start to question my preparation for the game – self-doubt big time. I had been successful in reaching this level with only a couple of levels to go: every child who plays sport has the dream of representing their country. I was no different. A select few reach that level and they do that because they are willing to sacrifice what tenderness remains from whom they were as very young children. Yes, there is the physical aspect and talent side to it, but some are more willing to sell themselves in exchange for further developing those talents and physical requirements. I knew by this time that, as mentioned above, I was just better than average. I would never reach the top because I never thought that I would. In saying that, I never played that way – I always pushed myself to my physical limits, whether at training or in a game. I still believed that punishing myself physically was a way of getting the results that allowed me to feel good about myself. People would like me for what I did, for what I was able to achieve. You might have picked up a thread through this article that I did not like myself very much – and you would be right. I was a very nervous and anxious man, and this carried through to how I played sport. I was not a risk taker. I was very conservative in how I played, not wanting to make a mistake. This was always going to cap what I would achieve. There is an old saying – play to win. I can look back now and say that in most cases I played to not lose. This was my everyday life being played out in a sporting context… or was it the other way around? Playing sport comes with the potential for injuries, and I have had my fair share, although I always regarded myself as doing pretty well as far as injury was concerned. I can look back now and recall the torn ligaments or tendons in the ankle and knees, the torn hamstring, groin or displaced hip, broken bones in my back, broken or dislocated thumbs or fingers, dislocated collar bones, head concussions or the many stitches inserted into my head and face to close up lacerations. If I was doing okay, how were the others doing? Our willingness to play with injuries and put up with the pain is a measure of one’s toughness. Men, and now women, are identified by their ability to ignore what their bodies are telling them and sometimes play with serious injuries. Did you know that women play all of the football codes these days, including rugby league and rugby union, two very tough contact sports? Is this really the equality that women are seeking? Sport is about winners and losers. For every winner that gets to celebrate, there are many who suffer the hurts of being not good enough, beating themselves up because they should have done this or not done something else. Even those that win need more – an athlete that wins but wanted a faster time, for example. Why would we willingly and deliberately do this to ourselves and other human beings who are no different from us? Sport is competition, no different from two countries fighting over land, water or commodities that lie beneath that land. In that sporting competition I hated the people I was playing against. They were my enemy. They were the ones trying to stop me from being recognised. It was war, but with who? Who was my real enemy? To complicate things even further I started drinking at the age of 17 and the sports that I chose to play had very ingrained cultures around drinking alcohol. I was playing with much older, more experienced men, and not just on the sporting field. We pushed ourselves to the limit physically and then rewarded ourselves by going to the pub or club for a schooner or ten. I usually lost count before that stage. Drinking a schooner was the standard glass size – I think from memory 15 fluid ounces, while a middy, the next size down and being 10 fluid ounces, was generally for those who weren’t real men. I was not all that good at drinking. There was always competition in the drinking. Some men claimed their authority by drinking faster than others or by how many beers they could drink. You had to try and keep up – you were defending yourself as a man. Some claimed a short-lived notoriety by sculling (drinking the whole glass in one go) their schooner of beer, or what was called a half-yard glass. The drinking is designed to further entrap us, and in my case, it allowed me to escape any responsibility, any issues or problems that I may have had. They were always still there the next day, trapped in a cycle of train, drink, play, drink. The culture around alcohol in sporting clubs at that time was poisonous. I am quite fortunate to still be here in this life having narrowly avoided a serious car accident on more than one occasion when driving after drinking. I was still living at home with my parents. It must have been horrible for them knowing that I was out drinking and then driving home. This pattern of behaviour remained the same whatever the sport. A new sport came along for me, touch football, not as demanding on the body as rugby league, but had all the same trimmings as the others. I could feel better about myself because I was good at playing the game, then drink to forget the fact that the real me was hiding behind this magical show. Everything was short-lived and just a temporary fix for the problem that I had. It was never going to provide me the opportunity that I was searching for: to return to the qualities that I had when I was born and to leave behind all the ideals and beliefs that had been imposed upon me by the world and reinforced by sport. My very competitive mother is in her 80s and stills hits a small, mostly white ball around a golf course. She is very hard on herself if she plays a bad shot and still loves to get a lower score than others. On a recent visit to see them we had a discussion about the changes that I have made to how I live, and sport came up – naturally, as that was how my parents identified with me, as a sportsman. Sport is still a big part of their lives. They will spend hours watching golf, tennis, rugby league, cricket. Dad loves the trots on the T.V. I was able to explain to them what I now know was my real purpose for playing sport – to receive recognition and be liked by people. I was looking for other people to make me feel better about myself, to hide the pain that I felt from withdrawing from the qualities that came with me when I was born. My mother’s response pointed out to me something that I already knew all those years ago but conveniently ignored, and that is that people already liked me – my real problem was not liking myself. My father sat quietly to one side, understanding the conversation but not ready to accept that sport is used as a tool to pull us further away from our Soul and God. This was no different from myself when I came across the teachings of the Ageless Wisdom presented by Serge Benhayon. For several months I stoutly defended sport and competition and today, six years later, my ears will still prick up when the word ‘sport’ is used. Competition? Did I mention that competition is also present in our relationships at home as well as at work? For some, it dominates their life. I know it still exists in me, albeit at very low levels and it affects my relationships with myself and other people. What if we could live a life where everyone was equal, where we would need nothing from others because it was already within us. What would our world look like if this was the case? I work in a secondary school and when I see a boy hobbling in on crutches or has any type of injury, 9 times out of 10 the answer to how they sustained it is because of rugby. Personally I have real difficulty reconciling a sport that is clearly so dangerous and yet these injuries are an accepted norm. What are we doing collectively when we celebrate something outside of us that is clearly so devoid of any type of care? Wow we really put our bodies under lot of stress and compromise by pushing it and driving it through something that is really not natural to us. As I walk around a sporting ground near a place where I live there are varying age groups of kids starting from the youngest ones who seem playful and have a lightness about the way they play, up to the older boys with a coach screaming orders. These older boys have started to become serious and hard, no longer is it about playing, but now playing to win. This is such an astute observation. When we take the play out of life we are replacing joy with a lot of tension and discord. We hide behind sport to bring us ways of behaving like competition, aggression, anger and separation, instead of living with tenderness, fragility and beauty. Everybody gets to choose which energy they align to. Selling out at the expense of tenderness is something we virtually all do, whether it’s on the sporting field, the field of academia or simply giving up. I the strive for recognition with anything out side of us we harden and true away from our true essence. It feels so sad that men and women choose to be tough instead of shining in their tenderness. The world felt too hard at some stage of life, but there is always a choice to connect back to what we know dwells inside all of us, and start a trend to make sport an outdated pastime. Working as a physiotherapist, there are many people who suffer long term injuries after sport, and lots of people have problems as they age because they have wrecked their bodies by pushing to extremes when playing sport. No way is it good for the body. Recently I’ve realised that I get into a competitive streak while driving. I’ll want to get into a gap before another and it does bother me. The more I connect to the qualities I was born with the more these adopted behaviors get highlighted. I don’t like these streaks but I am glad I am becoming aware of them. We champion sport as a great place to learn lessons which will support us in life but in fact it is setting us up to repeat things which have not served us for many years. 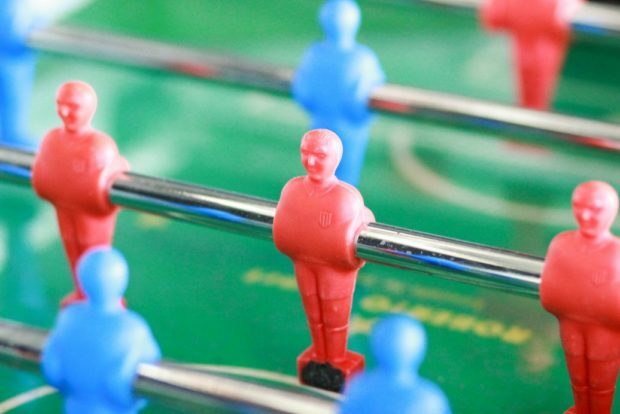 As soon as we get drawn into a football or rugby match, wanting one side to win or lose, we ourselves are lost in the horrid game of competition. It hurts everyone. The world would certainly not have to have any big sporting events, people would put money and resources into things that were evolutionary rather then something that prompted separation between families, friends, towns and cities. Sport encourages us to become competitive and then we use this competitiveness to establish some sort of security in our lives, without really appreciating just how harmful a behaviour it is. In more recent years I have come to realise there is absolutely no need to be competitive, as it only ever favours the individual not the whole. Real security is established by learning how to cohesively support each other, to build a cohesive and stable community, something that can never be established by out doing each other. Selling out of our tenderness because we want recognition – be it in sport, music, drama or academic work – is so common in school systems currently, fuelled by the competition engendered there. What if we were taught to value, appreciate and love who we are – just as we are- would we still need to try to beat and be better than others? It is key, so important to have a strong foundation of love, and appreciation, for ourselves. Competition is rampant in society and I certainly grew up seeking attention through competition – though I did not like feeling how my friends felt when I won, I did briefly enjoy the short celebration and attention that I got from parents or teachers etc. But even this was not long lasting and then came the pressure of having to perform again in order to get noticed or to get attention. This is not a fun way to live ones life and though I understand it more now, and have not actively engaged in it, there is a part of me that still buys into the competition though I am trying to shake it completely from my life. I thought I loved the camaraderie of being part of a team sport, the being together and being on the same side, but I always hated the competition element; the high drive, the push and the disappointment of losing; winning I felt the hollowness after the short elation. And its not just the players who are affected. I had a football mad boyfriend who went into very low moods when his team lost. It was unpleasant to be around. Equally the highs after a win, which were very short-lived. Sport, especially when it is competitive seems to contract the body and bring more tension – stretching and ways to bring more space to our bodies allows for greater expression and connection. A once of competition is an ounce of disharmony as we are no longer in union with another and it is felt instantly. Thank you for sharing Anonymous – this very much exposes how our ideals/beliefs can control and dominate our lives. ‘Life without competition’… I come to realise more and more that not only is this actually totally innate and natural for us but it is, more so than ever before, essential that we explore and re-introduce a way of living that is devoid of competition. So true Matilda. I was recently involved in a group interview process in which we were asked to collaborate on an exercise. It was interesting to see how competition undermined true collaboration in the group. The understanding that competition undermines true collaboration is vital. We do people a disservice and shoot ourselves in the foot as society when we ingrain it in people from young that they need to compete and whoever achieves ahead of others is favoured. We could instead encourage and foster the ability to collaborate with the interest of everyone at heart. When in competition we often have adrenalin levels coursing through our blood, and hence if we sustain an injury, we are less likely to feel the pain or the impact on the body immediately. There is a disconnection from the body which means we can injure ourselves more and more severely and then still continue with the sport than we would if we maintained the connection and knew exactly when to stop and how far the body can go. This seems pretty crazy in reflecting on it! Sports in general is a very competitive arena, in fact I cannot think of a sport that is not competitive in some way. And in addition to this the competition spills over to many other areas in life, and many see this competition as a good thing in that it ‘drives’ us to improve or better ourselves. But at what and whose expense? It is always in comparison to another and being ‘better’ than another….does this not set us all up for failure in life in terms of connecting and deepening our relationships with each other? In truth, I feel that competition does not lead to improvements, but rather sets us up for failure. Why not instead allow ourselves to be all that we are and have others be inspired to express likewise. Now that is a different scenario that does not involve competition but in fact involves supporting others to express what is naturally within even if it means that they might ‘surpass’ what you have been able to express in that moment in time. What a way to grow together! Note: I feel we are not yet at a point in society where we can all be doing this, so the transition to this inspiration with absence of competition does need to happen in increments and gradually. I know there is much I have learned to let go of in terms of competition around sports, but there is yet more for me to let go of in all areas of life when it comes to competition! There is so much sport on the TV over the holiday time to keep everyone in complete distraction and checked out from what can be felt about the illusion and commercialism of Christmas, or instead we can choose to connect to our families and enjoy the time together. Why is crushing children and adults our national pastime? What is going on that this is acceptable? Oh my gosh Ariana, I remember seeing how crushed some of the kids looked when they were picked last on the teams and it was excruciating to see – it never sat right and I couldn’t agree with you more. It is not ok to belittle or crush anyone and yet this is so normalised we dismiss it. Well said Ariana, further to this even those who are perceived to be good at sport and who have some form of acceptance and recognition for it are driven by this and it is far from healthy. They too will also experience the same feeling of being crushed when they are not successful in that which they are invested in. To be liked for what we do at the expense of who we are is one of the greatest punishments we could possibly endure. That really brings it home Henrietta of how devastating and demoralising it is to have what you do championed at the expense of who you truly are. Comparison is a killer – if we win and prove to be ‘better’ than those around us, this recognition only lasts a very short time and we are back to the same position of fighting tooth and nail to be the best next time around again. If we come second or 3rd or 4th this is never good enough, and we feel like we have failed. We judge our worth based on our physical accomplishments and process and based on our comparison to where we sit amongst others rather than looking at our true qualities and our natural capacity to be where we are at given our make up – both physical and beyond. This gets us no where other than to stunt our true growth – it is in fact a brilliant tactic to distract from any true evolution for most of us fall for it hook line and sinker. Yes. most of us buy into this which takes us away from the bigger picture and our multidimensionality. As you say comparison is a killer. As I was reading your blog Anon, I became aware how I too ‘did not like’ certain sports based upon how good I was at them (or not) and with what ease it came to me (or not) – all based upon results achievable and the recognition that came with it. What a revelation! It is interesting how far we will go to please other people even when we know inside the direction is not right for us. The body has the impact, physical and energetic, and feels all the repercussions of our decisions. How great that you have caught this game anonymous, lots to appreciate here. ‘Selling out at the expense of tenderness’. Definitely not worth it since I am discovering that not only is tenderness one of our greatest strengths but also it is with tenderness that we access our other great natural qualities – sensitivity, awareness, openness and connection as examples. There is a hardness that our bodies must go into to engage in sport and all the time we bury the innate tenderness that we are. I remember having to go into the hardness to play Rugby when I was younger and I hated it, so would run as fast as possible to not get tackled as it felt so crushing on my body. Celebrating or the celebration of the tenderness of our bodies is not a romantic ideal like something we play with on special days but is what is felt by all the people who live in a way that allows our-selves ‘to love and be love’ for without the latter how can we Love another. So celebrating life is something like a fashion or approach to life we live for and with true love we all are then also living with the natural tender person we innately are! And could it be that all sports loving people “so called” are having an affair with shutting down our true tenderness for the sake of competition? I never liked sport as a child mainly because I hated the competition and would never push myself to beat another. It just didnt feel right. However its hard to survive in a culture that encourages this kind of attitude in children when the majority are going along with it, and without the true support to not get pulled in, thats what inevitably happens. And the competitiveness continues to reveal itself in other ways as we get older until we make a choice to stop it. Same here and yet we have society divided over sport on a daily basis, perhaps we should listen to the feeling we know deep inside. Well said Sandra for competitiveness is alive and thriving in all its various ways even away from the sporting arenas – such as competitiveness and comparison amongst women and dressing or make up etc, or with businesses and with cars etc etc. It is rampant in our society and the question is simply how much do we play into this game and allow it to control our choices and lives? Playing sports can create a togetherness, and that is what many people seek. And rightfully so. But then this togetherness comes with a price, the price of a body that has to suffer and the price of beating other people. So the question is: is this the true togetherness we are seeking? Our bodies are such a great reflection of whether we have been living in harmony with our innate essence and the flow of the Universe we are a part of. Although we are not educated or brought up to do so, whenever we sense we are running at odds with our body, it is worth stopping and unpacking the greater awareness available to us. The effects of sport on our bodies and the harshness of competition in the world is something not to be celebrated for the harming it causes us and the reality of what is really going on and the way we are living is so far from the love and tenderness of who we truly are. Working in a school I am aware of how many boys get injured through rugby. There is not a day that goes by where I don’t encounter yet another student who is unable to write or walk because of injury. The other day I asked a student if playing rugby was worth the crutches and the inability to move around. He conceded it wasn’t. So true. We already are liked by people we just have to like ourselves. I love this Adele. It never ceases to amaze me just how deeply rooted lack of self-worth is when it is abundantly clear that the person before me has a whole host of gorgeous attributes. They either negate or under-appreciate them because they have false pictures they measure themselves against that seemingly don’t fit with their innate qualities. If only they could see that those innate qualities are infinitely richer than any image of how we should be could ever possibly possess! I love your honesty in the blog anonymous, ‘I showed no appreciation for what I received; in fact, I expected nothing less. My parents got what they wanted but I was making them pay for it.’ Perhaps this shows us what can happen when we invest in our children and ‘want the best for them’? It is a huge thing, parents pushing children according to the model prescribed by society because we ‘want the best for them’. Yet I have come across so many who later in life realise they were pushed into areas that they would not have chosen for themselves and are holding on to the resentment that comes with that. I imagine it must be one of the worst things ever, ticking all the boxes of being a great parent and yet watching your child end up nowhere near the great life you imagined you were pushing them into, and in fact sometimes the opposite. True Rachel and you highlight something which stands out for me – that investment in what’s best for our children can also be what parents want for themselves too due to ideals and beliefs. We like to feel we belong, so we are attracted to being part of a team, fitting in and uniting as a group. We are designed to work together but not in competition with others or pushing ourselves to crazy limits. We are lost if we sell out our delicateness for the sake of beating another. Love this Gill, lets not sell out for anything. Lets be together in truth not in arrangments of any sort. Not in competition but with the purpose of evolution. So true Gill, it is the longing and knowing how we are here to work together that gets us into sports in the 1st place as we feel united but when we actually truly come together to work and be it feels completely different and the whole ‘team sport’ mentality shows itself for what it is and it is merely a substitute for the truth we know.